So I can’t take credit for this one. I happened to have a few moments break between NYFW shows and while checking emails, saw this and thought – THIS IS SO COOL!! The original link to this is from a site called “Very Culinary” (they adapted it from someone at a site called She Knows) and they have quite a few really easy and yummy goodies to make. Nothing is better and more thoughtful than having something homemade and on Valentine’s day, this just might be the ticket to romance. For those of you that like chocolate, I’m sure you can use chocolate cake mix and the colors would really pop if you did. Pour batter into prepared pan and bake for 8-10 minutes less than instructed (about 50 minutes.) Let cool, remove from pan and refrigerate for up to 4 hours. 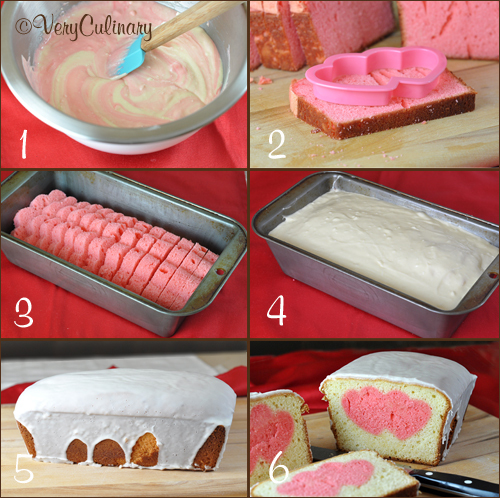 Cut cold cake into slices the thickness of your cookie cutter. Cut heart shapes from the slices. Set aside. 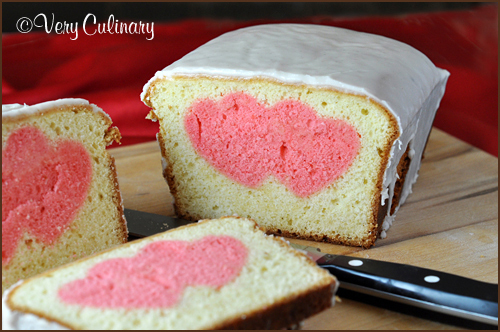 Remove baked and cooled pound cake from pan and top with icing. Let set; cut into slices and enjoy! This is way too cute!! ← What no mail on Saturdays?